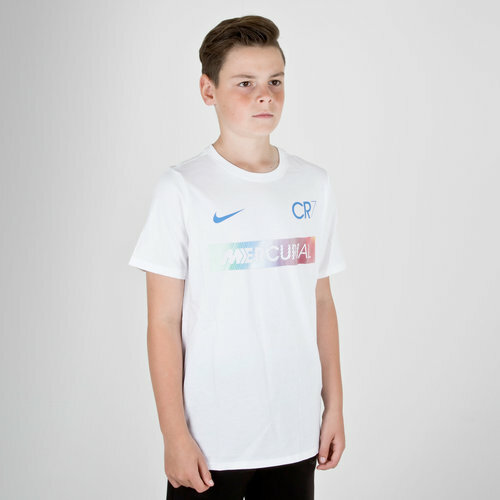 Stylish and unique, just like the way Ronaldo plays the beautiful game, let the kids train in style with the Nike Ronaldo CR7 Kids Dry Fit S/S Football T-Shirt in White. Forming part of Nike's CR7 Chapter 5 range, this short sleeve training t-shirt comes in a white with a reflective Mercurial box logo graphic on the on the midriff just below the Nike and CR7 logos. Made from a lightweight polyester material, Nike Dri-Fit technology within this training top helps ensure the wearer stays feeling cooler, drier and more refreshed when in action by wicking sweat away from the skin and quickly evaporating. A mesh back also helps increase air circulation to enhance the cooling effect. Train with a performance worthy of the main man himself with the Nike Ronaldo CR7 Kids Dry Fit S/S Football T-Shirt.